Yoga classes are held in the Village Hall Monday evenings between 6.30-8pm in school term times. These are Iyengar Yoga and are taught by Jenny Furby. Iyengar Yoga is a form of yoga named after and developed by B.K.S. Iyengar. Iyengar Yoga has a focus on posture (asanas) and breath control (pranayama). 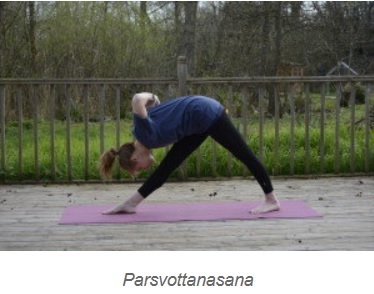 There are a vast range of poses to learn all of which will develop the mind, body and spirit. Yoga is a big part of my life and I have had over 20 years of practice behind me and been teaching for more than 10 years. Classes are mixed ability from Beginner level to Intermediate. Classes are friendly and all are welcome. I have been practising yoga for more than 20 years and qualified as an Iyengar Yoga teacher in 2005. In addition I have passed the Junior Intermediate Levels 1, 2 and 3. I have been fortunate to travel to India and study at the Ramamani Iyenga Memorial yoga institute in Puna in 2010 and 2012. At the institute students are taught by members of the Iyengar family and other Senior Teachers. I also go to regular classes, teacher training classes and workshops.